"How To Know God’s Will!" Ever wonder how you’ll know what’s God’s plan for you life? To many, it seems God’s will is a mystery. Should I go to this school or that one? Which job should I take? Should I marry? Whom should I marry/date? If you’re a person who’s unsure what’s God's will for your life, please read on. What I’m about to share to you is an opportunity for you to understand God’s will for your life. Isn’t that exciting? Imagine living a life in perfect will of God. For many years, I’ve been struggling to determine what God’s will is. And because I’m confused and unsure about things, I was paralyzed because I’m afraid to take action that could potentially be outside of His will. Have you been in a painful situation and you asked God... "Lord, why did it happen to me?" ...unexpected death of a loved one. ...fired from your job though you’ve been faithful to the company. ...marital problems that feels like the only solution is to separate....endless health issues. ...should I get a new job? ...is it time to buy a new car? ...should I move to a new place? We always make decisions. Big and small. But the thing is, most Christians can’t discern God’s will for them. They can’t hear God’s voice. As I mentioned earlier, I’ve been in that confusing situation too many many times. This led me to read books from various Christian authors, Bible scholars, and most importantly read the Bible. What I learned through research is God is in fact excited to tell you His will. Not everything but those important things you need to know. God doesn’t intend to keep His plans for you. I discovered that there are three primary reasons why God’s will has eluded many believers. God is willing to tell you His secrets but you’re tuned them out. So you can’t hear Him. If only you’ll pause and seek his face, you’ll realize that His will is indeed obvious. And once you realized His will, His choices will be your choices. You’ll be living at the center of God’s master plan. Without giving you clear and simple steps on how to do that. Leaving you hanging and more confused. Lastly, many Christians can’t hear God’s voice because they’re simply ignoring what God’s will is. Meaning, God’s will is clear but they have a different plan. They don’t like what His will is. This often happens when choosing a partner in life. And once they’re in a troubled relationship, they’ll blame God or question Him why he or she is with a wrong partner. Now Imagine this for a second. What if you can clearly and undoubtedly know God’s plan for your life? How much would your life improve? How would your relationships improve? How would your finances improve? You’re certain on what steps to take to move closer to God’s will in your life. Easily identify who is the right person to be your partner in life. You’re confident about your decisions and you know that it will lead you to a better and peaceful life. You’re living in the center of God’s will where there’s abundance, joy, and satisfaction. You have an answer to why things are happening. You can clearly see the hands of God moving, even if you’re in an unpleasant situation. Listen, yes, we can’t answer all the mysteries in this world. But the almighty God is willing to reveal more about Himself to you. His will is to help you and not to harm you. And to give you hope and a future. As stated in Jeremiah 29:11. My brethren, life is too complex to go on your own. The devil is out there looking for someone to devour. FACT: You need God and you need His directions. Save yourself the trouble of figuring things out. We have a God that’s more than willing to reveal to you great and amazing things. So with your permission, I would like to introduce to you a brand new resource that Dawn and I have developed. This course contains simple steps that you can take in order to discern what God’s will is for your life. It’s more than a book but a complete course to take you from confusion to clarity. Obstacles for why you can’t hear His voice even if you’ve been praying. Steps to take towards discovering God’s master plan. How to clearly identify what’s NOT the will of God. How to remain at peace despite all the troubles and difficulties you’re experiencing. The “Two Types of God’s Will” that most Christians aren’t aware of. “What Would Jesus Do” A simple formula to quickly see where God’s trying to lead you. Why are you suffering from things you feel you don’t deserve. How to find the right God-centered partner in life that He has prepared for you. The right career path you should take for you to prosper. How to have certainty in all your decisions, knowing God has led you. Solid and Biblical sound advice in finding your purpose in life. Answers to some of the mysteries in your Christian life. Steps to practice to get back into God’s will and please Him. No nonsense teaching in discovering God’s destiny for you and your family. Now, this exclusive Memory Delight course are in both e-Book (printable) and Audio book format. We made it this way so you have various ways to learn and study how to know God’s will in your life. This short but powerful electronic book contains over 50 pages of valuable insight that will walk you by the hand in discovering His will for your life. It’s divided in 6 chapters to represent simple steps you need to take to know the answers to all the questions you have in mind. The best thing about this e-Book is it is in a printer friendly format. Meaning, if you prefer to read in paper, you can easily print this from your computer. 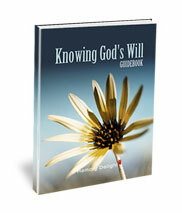 This book has over 2 hours of Biblically sound teachings about discovering God’s Will. We created this professional audio version of the book so that you can listen anytime, anywhere, 24/7 - including while you do other things, such as commuting to work, working out at the gym, doing household chores, walking, driving, mowing the lawn or doing other outside work, at night while your partner sleeps (you won't keep them awake by having a light on), and much, much more! As a bonus, we’ll also give you this actionable work book to help you even further in discovering God’s plan for you. You see, we don’t want you to just listen to what we’re about to teach you, more importantly, we want you to take action. Remember, faith without action is dead. And with the help of this work book, you’ll be guided to take action. This one-of-a-kind resource is available as instant download. This means, you’ll receive this product through your computer. No more waiting for you to receive this product in your door. You save over $100 from printing, packaging, shipping, and handling. PLUS, you’ll get access to this great course instantly and begin your journey in knowing God’s will. 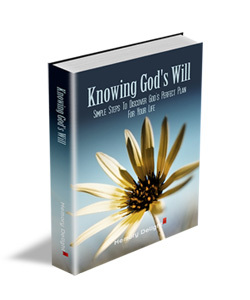 Knowing God’s Will: Simple Steps To Discover God’s Perfect Plan For You is not available anywhere else but here at Memory Delight. My Iron-Clad, Unconditional 60-Day, 100% Money-Back Guarantee, You’ve Got Absolutely No Risk And Nothing to Lose! That's right! You’ll have 60 days - that’s two whole months - to see if this course works for you. If you think it’s not working after applying everything you’ve learned, then just give us a call at 1.800.680.1119 or email us at [email protected] and we’ll give you a full refund. So there’s no risk for you at all. Right now, while its fresh in your mind, click the big "Order Now" Button you see below to lock in this great deal and get on the fast track in knowing God’s will. P.S. Remember, God doesn’t want to hide things from you. He wants you to know His plan and His will. Now is the time to discover the answers to all these questions that you have in mind. PLEASE! Don’t take actions and make decisions blindly. Instead, let God lead you all the way to a life where there is peace, joy, and satisfaction. A satisfaction knowing that you are living in the center of His Will. Click here to get your copy of this course.